Have the current offer from the Livestock and Dairy Development Department KPK Jobs 2018 Peshawar Advertisement. Here in this month of January 2019 vacancy from Livestock & Dairy Development Department, KPK Peshawar is seeking to appoint the literate and those of minimum qualification holding applicants for the following positions given below. 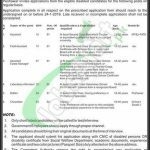 Jobs in Livestock & Dairy Development KPK (Assistant, Field Assistant, Assistant Estate Manager, Laboratory Attendant, Daftari, Chowkidar) are on a contract basis and announced positions are on disable person quota for which only disabled candidates meeting criteria should apply as soon as possible. The overall qualification of Bachelors to Matric/Middle is required with per field expertise are needed to hold such posts hastily. Age limits are different to be seen from the advertisement image. Domicile holders of KPK and Tribal Areas are welcome to apply. Now, I will make you aware of its rest of the details below. Livestock and Dairy Development Department Punjab is a Government Department under the supervision of Punjab Government for the improvement, development and growth in Livestock and Dairy sector via enunciating different projects and make the department worth by increasing the good side and its growth and for this and this department is established in every district of Punjab which offers all sort of career opportunities from Graduation to Matric level. Applicants meeting criteria may apply on prescribed form available at www.JobsAlert.pk. Application Form along with attested copies of educational certificates, diplomas, CNIC, domicile and recent photographs should reach the following address given below. Position applied for should be clearly mentioned on the envelope/application. The last date for submission of application is January 24, 2019. Only shortlisted applicants will be called for test and interview. Last Date For Apply: January 24, 2019. Address: Directorate General (Research) Livestock and Dairy Development Department, KPK, Peshawar.